What is most striking about it is the position of Vindija, an Upper Paleolithic Neandertal specimen which is clearly closer to Homo sapiens specimens than any of the Neandertal or archaic humans. The first component is one of increasing (left-to-right) modernity, with Australopithecus on the left, and modern humans on the right. Apart from Vindija, the two West Asian samples from Kebara and Shanidar also appear quite "modern" in terms of their component 1 position. There are two possible options: that Neandertals and modern humans were evolving in parallel towards a "modern" scapular glenoid fossa shape; or, that these Neandertals may have experienced gene flow from modern humans. 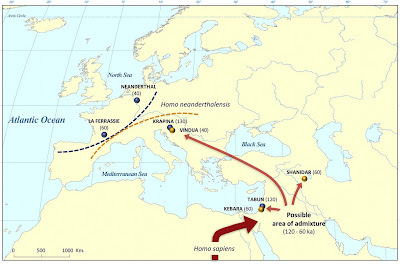 I am inclined to accept the idea of gene flow: Kebara and Shanidar are from the time when genetic evidence suggests that the major expansion of modern humans was well under way, and Vindija from a time when they had most probably already arrived in Europe. If there was AMH-to-Neandertal gene flow, these are exactly the Neandertal specimens that might be affected, and not, e.g., the >100ka European Neandertals that can be safely assumed to lack any modern human ancestry on a variety of grounds. There is as yet no evidence that the Vindija Neandertal genomes have genetic introgression from the African populations from which present non-Africans derive most of their genetic heritage. Green and colleagues  tested explicitly for this kind of gene flow, from "modern" into Neandertal populations and found none. We've now had enough contrasts between Mesolithic/Neolithic and present-day DNA to cure us of the illusion that populations are largely static: we simply have no evidence (until we actually test them) as to what early modern humans in the Near East and Europe were like genetically. Regardless of what one thinks about the recent Out of Africa hypothesis, the fact that the one sample on which the "Neandertal genome" is based appears to be so close to modern humans compared to other Neandertals should give us pause about the reasons for its apparent involvement (in some way) in the story of mankind. In the Levant, Tabun (120ky) is less modern than Kebara (60ky). This is exactly as we expect if there was a major human expansion c. 70ky, as I have argued for in my blog post on L3 and here. The same difference between Krapina (130ky) and Vindija (40ky), the latter just at the time when modern humans were getting there. Notice also how "natural" Out-of-Arabia fits with the rest of the scenario: a group of expanding humans from Arabia (south-to-north) forms a natural extension that would affect Kebara, Shanidar, and ultimately Vindija. I won't even bother with the Coastal Migration Theory that seems utterly unable to explain modern-Neandertal interbreeding. Fabio Di Vincenzo et al. Although the shape of the scapular glenoid fossa (SGF) may be influenced by epigenetic and developmental factors, there appears to be strong genetic control over its overall form, such that variation within and between hominin taxa in SGF shape may contain information about their evolutionary histories. Here we present the results of a geometric morphometric study of the SGF of the Neanderthal Vi-209 from Vindjia Cave (Croatia), relative to samples of Plio-Pleistocene, later Pleistocene, and recent hominins. Variation in overall SGF shape follows a chronological trend from the plesiomorphic condition seen in Australopithecus to modern humans, with pre-modern species of the genus Homo exhibiting intermediate morphologies. Change in body size across this temporal series is not linearly directional, which argues against static allometry as an explanation. However, life history and developmental rates change directionally across the series, suggesting an ontogenetic effect on the observed changes in shape (ontogenetic allometry). Within this framework, the morphospace occupied by the Neanderthals exhibits a discontinuous distribution. The Vindija SGF and those of the later Near Eastern Neanderthals (Kebara and Shanidar) approach the modern condition and are somewhat segregated from both northwestern European (Neandertal and La Ferrassie) and early Mediterranean Neanderthals (Krapina and Tabun). 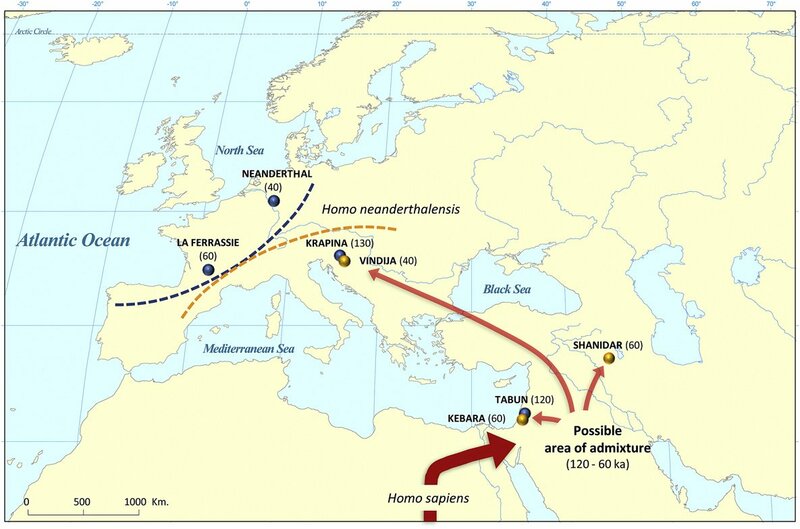 Although more than one scenario may account for the pattern seen in the Neanderthals, the data is consistent with palaeogenetic evidence suggesting low levels of gene flow between Neanderthals and modern humans in the Near East after ca. 120–100 ka (thousands of years ago) (with subsequent introgression of modern human alleles into eastern and central Europe). 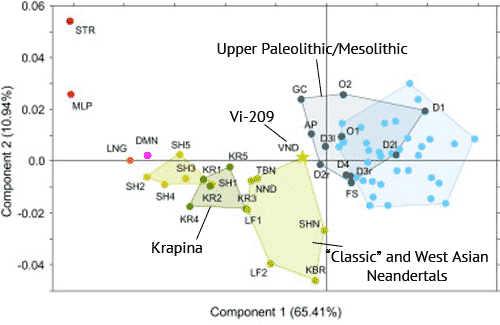 Thus, in keeping with previous analyses that document some modern human features in the Vindija Neanderthals, the Vindija G3 sample should not be seen as representative of ‘classic’ – that is, unadmixed, pre-contact – Neanderthal morphology. "There are two possible options: that Neandertals and modern humans were evolving in parallel towards a "modern" scapular glenoid fossa shape; or, that these Neandertals may have experienced gene flow from modern humans." Parallel paths seems to be more likely. If it were gene flow, Vindija would've ended up entirely within modern human variation. Close but no cigar! The relative amount of gene flow from modern humans would dictate the relative position of Vidija, which could end up anywhere between unmixed pre-contact Neandertals such as Krapina all the way to modern humans. Hence your comment is stupid. What did you mean by this? Compared to the Denisovan genome? It does look like progressive flow of Homo sapiens into the Neanderthal population (to me). Fascinating. Wish I could see the exact code for the samples and their exact ages. It does seem also that we should be very careful of the "Neanderthal" calculator if it is based on the significantly admixed Vindija sample. Its not really neanderthal if Dad was potentially Homo sapiens, or effectively Homo sapiens. Vidija is a lot closer to modern humans (the pentagram) than it is to some of the Neanderthals. I think part of the picture is missing however. What is pulling both the paleo-human and neanderthal Component 2 down? Neanderthal received some unseen population (potentially gracile humans?) in the middle east reducing C2 and increasing C1. Neanderthal then received more of the unseen population (to make KBR, SHN) and in central Europe some of the more robust paleo/meso-humans (to make Vindija). Perhaps originally the Paleo/meso humans were derived from a gracile admixture with another archaic humanoid (with a high C2). Denisovan perhaps, or more archaic neanderthal? In Europe robust types of Homo sapiens do seem to predate graciles, but that is not the case in other regions (eg Australia) where the graciles seem to have arrived first. I am increasingly thinking that robust humans we have observed archaeologically were not the early primitive form but admixed forms. Haven't we always known that eastern Neandethals were more 'modern-looking' than were the western ones? "It does look like progressive flow of Homo sapiens into the Neanderthal population (to me)". And to me. The alternative of 'parallel paths' is almost impossible to accept. Parallel evolution is not particularly common and isolation tends to diversification rather than to convergence. "I do not see a problem with the coastal migration and neanderthal admixture, they may have just circumnavigated the Red sea and continue on the asian coast..."
I agree 100% with Dienekes. Not only is it 'utterly unable to explain modern-Neandertal interbreeding' it is also utterly unable to explain the modern distribution of haplogroups. Sure there may have been such gene flow, but making the argument based on three individuals' shoulder blades? "Haven't we always known that eastern Neandethals were more 'modern-looking' than were the western ones?" The problem is that until the quite late southeastern Neanderthal expansion ~60,000 ya, archaic humans in the region were closer to late heidelbergensis and did not have the multitude of specific neanderthal characteristics. So, in a twisted sense, they were more modern (less Neanderthal-derived) looking in the first place, and perhaps required much less genetic flow to look rather modern (in the AMH sense). IMO, anything that involves this region of West Asia involves three sub-species, not too. "IMO, anything that involves this region of West Asia involves three sub-species, not too". That is probably correctt. And one of those species seems to be where the 'Denisovan' elements entered the modern human gene pool. It was carried from there all the way to New Guinea, but not via India. Norton type man evolved from Homo erectus about 400.000 years ago. Slowly it exterminated Homo erectus people and were dominant human type on earth for about 350.000 years. Then about 40.000 years ago in the "old continents" new types started to evolve who gradually conquered Norton type's territories theferore from this point now on Norton type is in steady decline of population. In North and South America Norton type still remained dominant human type on those continents until XV century when european colonisation started.